Did you miss the last post, first post, or any post? Not sure? Want more on the subject of prayer? Hope your summer was fantastic and you are ready to jump into the season of Fall. You may already be familiar with some Bible verses that mention constant prayer but please take the time to look at a few scriptures with me today. If you have your Bible handy, please find the following verses. I hope you are able to read the entire chapter or more surrounding these verses. If you’re not able to access a Bible, please see the verses below in the NKJV. What does it mean to practice constant prayer? It is easy to begin our day with prayer. But how do we continue in a state of prayer once our daily activities have started? Well, why did the time of prayer end? Just because we leave the place where morning prayer began does not mean our time with God is over. One of the marvelous things about a relationship with Jesus is that He is constantly present. Our problem is forgetting He is there! The difficulty in maintaining a lifestyle of constant prayer is caused by not living in awareness of His continual presence. Is your life-quest for Jesus? Is your greatest desire to know Him? If so, you need to discover the joy of living daily in the awareness of His presence. This not only changes prayer but actually every single facet of your life. This is the last is the last post in the Summer of Prayer Series. Did you miss any posts? I pray that you have found something helpful in this series. Do you think of praise as an option? Is it like a p.s. that you might tack on at the end of a prayer? Is praise something you do when things are going your way? Praise is an important part of prayer and a joyful life. “There should be a parallel between our supplications and our thanksgivings. We ought not to leap in prayer, and limp in praise. Praise is not about your circumstances but about Who you are praising. God is always worthy of praise no matter what is happening or not happening in your life or mine. A praise-filled day is like the perfect outfit. It is always the right fit and goes with everything. So, anytime is praise time! Praise is a key to constant prayer. God is with us at all times. We live in His continual presence. We need to grab onto this powerful reality and apply it to our lives each day. Living in this awareness will cause praise to happen easily and often. Praise can become a lifestyle. Need some help getting into praise mode? Turn on some praise and worship music! The Leading the Way website offers literally 200 choices for sharing the content. So especially strange that Facebook is not allowing it since Facebook sharing is clearly encouraged on the website. 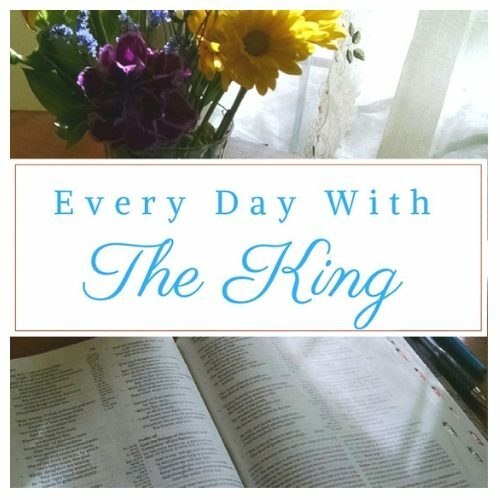 Every one of the posts that Facebook had taken off the Every Day with The King Facebook Page was mysteriously put back up on the Page! Praise is an important part of a healthy prayer life. I will praise the Lord at all times; His praise will constantly be on my lips. Christians are made to glorify God. We are never in our element until we are praising Him. Prayer and praise are the oars by which a man may row his boat into the deep waters of the knowledge of Christ. Do you want to improve your prayer life? Start praising and thanking God. A day filled with praise is a sure way of keeping your focus and attitude right. Infuse your life with praise and you will soon find joy in ordinary days. Selecting things for the Summer of Prayer is enjoyable and a little challenging. It is causing me to realize that having an abundance of material on prayer means the best is sometimes hidden from easy view. The true treasures can be found and like all treasure, it is well worth the effort. Here are some powerful insights from Corrie ten Boom on the subject of prayer. Want to learn more about Corrie?